Make Ice Cream in a Bag! 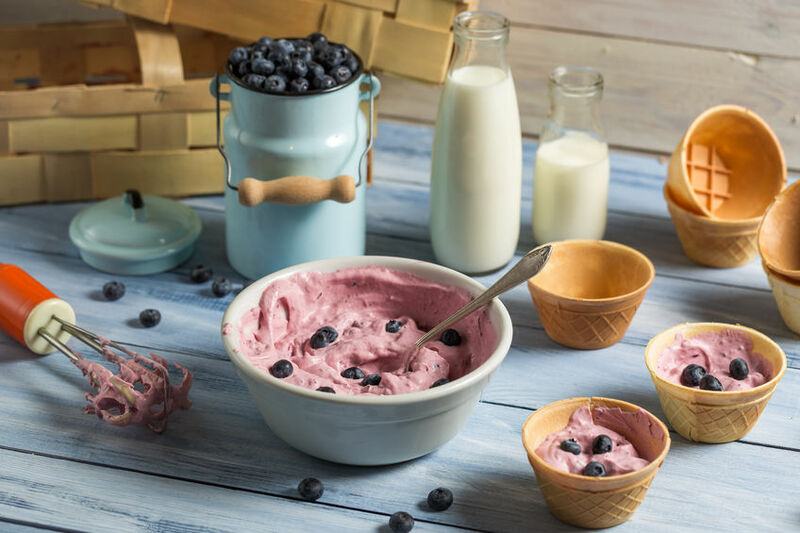 Grab your grandchildren to try these fun and easy ice cream recipes from Chef Jen Wanous in honor of National Ice Cream Month. July is National Ice Cream Month, and who’s the best person to celebrate with? Your grandkids, of course! Here’s a fun and easy way to make ice cream and the best part is… you don’t even need an ice cream machine. This method borrows from the old-fashioned ice cream churning approach, where coarse salt is used to make the ice even colder. Colder ice makes for a faster freeze, which means the ice crystals will be smaller and smaller ice crystals means creamier ice cream. The science behind it all is a bit more complicated than this, but isn’t the tip of the thermodynamics iceberg delicious? With a few basic at-home supplies and some coarse salt, you’re only 15 minutes away from a delicious cold treat with the grandkids. In the gallon-sized baggie, fill it with half the ice, half the rock salt and place the sealed baggie of ice cream mixture inside this larger baggie. Fill the rest of the large baggie with the remaining ice and salt, and seal the baggie tight. With an oven mitt or towel, shake the dickens out of the baggie (this is where eager little arms can help!) for 15 minutes. It should have a soft texture, perfect for eating right away. If it’s still too runny, shake for five more minutes. To serve, simply cut a corner from the bottom of the smaller baggie and squeeze out into a bowl, cone or mouth! * The recipe calls for “vanilla flavor” instead of the more common “vanilla extract” because vanilla extract has alcohol, and alcohol inhibits the ice cream’s ability to freeze as well. If it’s warmer than 72 degrees in your home, put the two cans of coconut milk in the freezer for about 15 minutes. This will allow the coconut milk to separate from the coconut water. The coconut milk (the white part) is what we want to make the ice cream smoother. Open the cans of coconut milk and spoon the top white parts out into the quart-sized baggie (leaving the clear coconut water out). In the baggie, add the maple syrup, chocolate cacao powder, vanilla flavor and almond flavor (if you have it). Push all the excess air out and seal the baggie (use double-sealing baggies or add duct tape over the seal). In the gallon-sized baggie, fill it with half the ice, half the rock salt, and place the sealed baggie of coconut ice cream mixture inside this larger baggie. Fill the rest of the bag with the remaining ice and salt, and seal it tight. With an oven mitt or towel, shake the dickens out of the baggie for 15 minutes. It should have a soft texture, perfect for eating right away. If it’s still runny, shake for five more minutes. To serve, simply cut a corner from the bottom of the quart bag and squeeze out into a bowl, cone or mouth! Grab your dog and try these Fido-friendly exercises. Have you saved for retirement? Check out these straightforward tips and resources for retirement savings.